Engineered reinforcement systems such as Steelgrid and MacMat R can be used in combination to rehabilitate roads that pass through complicated terrain. A transportation infrastructure project in the Veporské mountains demonstrates this phenomenon. Transportation infrastructure often calls for the help of engineered reinforcement systems. Numerous projects have benefitted from high strength steel wire mesh systems such as Steelgrid HR. One such project is the Zbojská, Sedlo – Tisovec Čertova dolina highway project. The aim of the road I/72 rehabilitation is to upgrade the layout of this state road that passes through the rough terrain of the Veporské mountains. The function of both products (above) is to secure the area along the road (road cuts) and to minimize the risk of debris and rocks falling onto existing roads and distrupting the infrastructure. During the construction stage, technical optimisation of the design concluded that a system of remedial measures using two high strength steel wire Maccaferri mesh systems, Steelgrid HR100 and Steelgrid HR30 and the steel reinforced erosion control geomat MacMat R1 was the optimal solution. 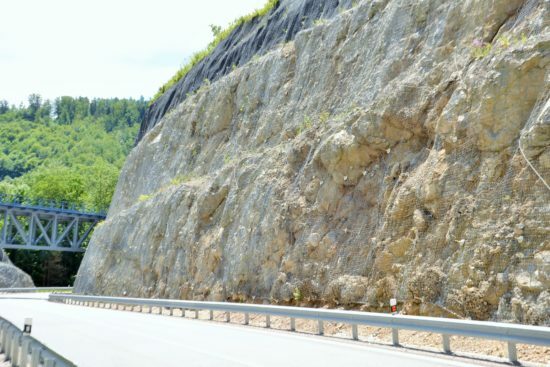 For permanent stabilization of the road cut against weathering and surface erosion, Steelgrid HR high strength steel wire mesh, anchored by Ø 32 mm steel anchors was designed. This system of steel wire mesh is additionally anchored around the perimeter and at the foot of the slope the Ø 12 mm steel cables, which are locally fixed using cable anchors.